I don't do endorsements lightly. And if I am paid for one, I will tell you. This one was not paid or even asked for, but I just really like this product, so I wanted to tell you about it. About a year or so back I bought some "Sun Spots". They are a soft plastic cling film that you cut to fit your glasses' lenses to turn your regular glasses into temporary sun glasses. And then you peel them off and stick them to a card that goes in a little credit card-sized envelope that fits in your wallet. They are not quite as good as regular sunglasses, in my opinion, but that's just because of the difficulty in getting my glasses clean enough before I apply them. One time I was able to wash my glasses off before I applied the Sun Spots, and that time my vision was very clear. Most of the time there is enough lint or specks of dust on my lenses that some bubbles occur that tend to blur my view a little. Not enough to be a serious problem; just enough to be noticeable. I carry a small bit of black silk cloth for shining my specs when needed, anyway, and this is what I usually use before I put on the Sun Spots. I wear 18th century style frames with glass lenses, and the small size of the lenses means I was actually able to get 2 complete sets out of the Sun Spot sheets they sent. 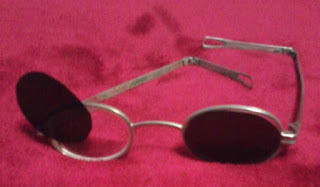 I made one set for my regular glasses and one set to fit my prescription sunglasses (slightly larger lenses) just in case I ever need extra protection. Anyway, you might like to have some in your wallet just in case.